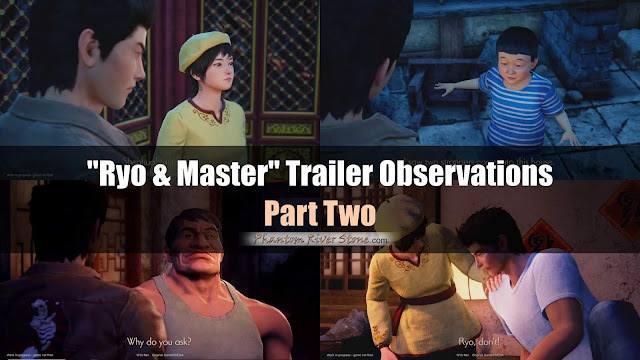 Welcome to Part Two of our close-up examination of the Shenmue 3 "Ryo & Master" trailer that was released at MAGIC 2019 earlier this month. 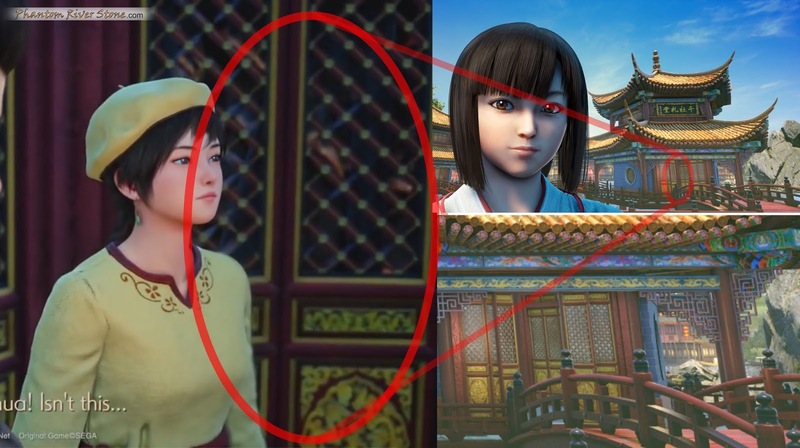 In the previous part, we saw a defeated Ryo being taunted by a character wearing the distinctive costume of a Mongolian wrestler: "Did you really think you could beat me with kung fu like that?" Part One of the analysis can be found here. Now let's continue with the next part of the trailer. 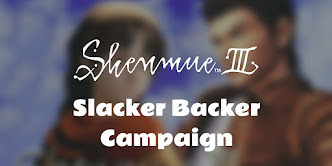 With a dramatic crashing sound effect and a flash of white, the scene changes and we see Shenhua standing in a black void, with the pink petals of the Shenmue tree falling around her. The camera pulls back to reveal the ominous figure of a man in green silk robes adorned with the motif of a dragon clutching a blue crystal ball: Lan Di. He moves towards Shenhua as she draws in her breath. Behind him, he holds a mirror in his hands, and as the light catches it we see a red stone in the center that identifies it as the Phoenix mirror. 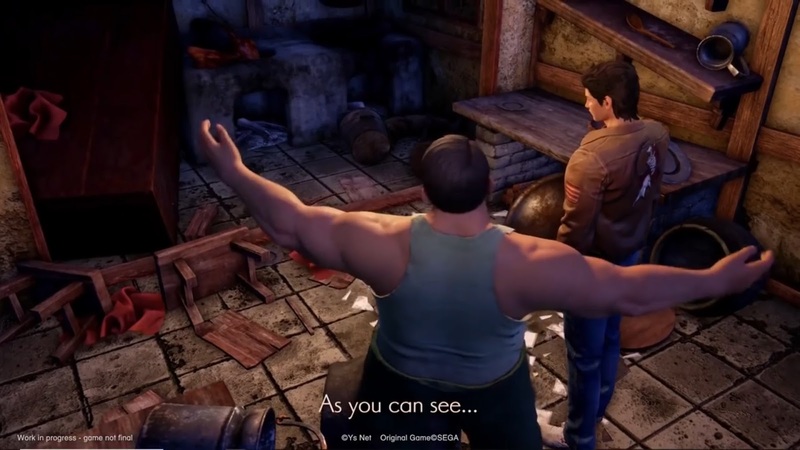 There are strong similarities between this clip and part of the "bad ending" cut scene in Shenmue II that plays out if Ryo has taken too long (specifically, after he goes to sleep on the night of July 31st). This cut scene consists of two parts: first, Ryo is holding the Phoenix mirror as it glows and cracks in front of his eyes, after which he is attacked by Lan Di; then Shenhua is approached by Lan Di who snarls, "I shall take your power for the Chi You". 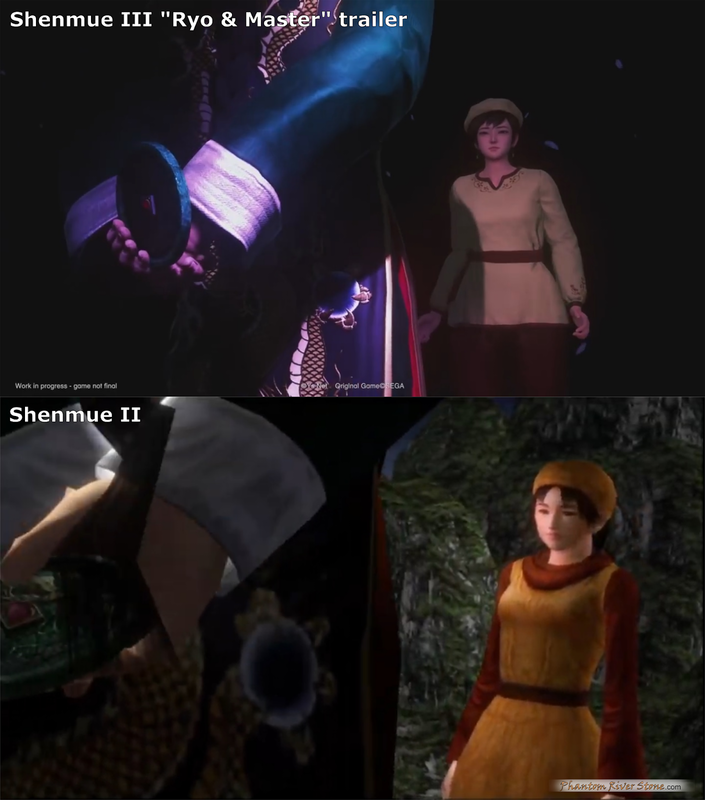 The clip ends with a close-up of Lan Di, giving us the clearest image seen so far of his facial model (shown with the Shenmue II model as a comparison). 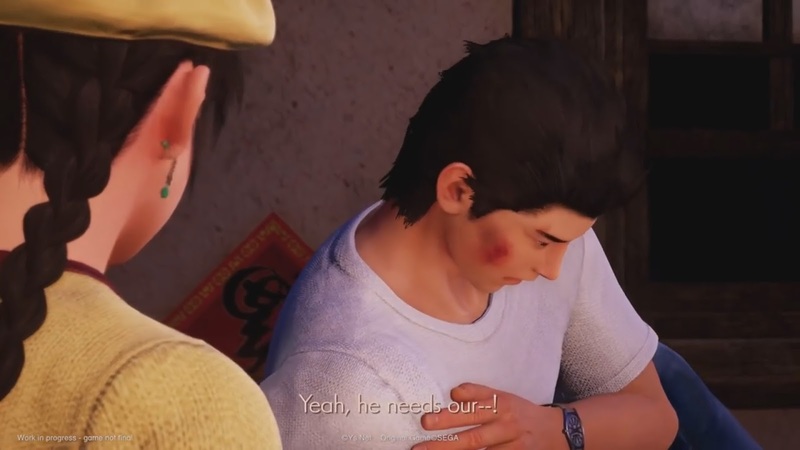 The scene in the next part of the trailer is one that occurs fairly soon after Ryo's fight with the Mongolian wrestler, as Ryo still carries the same he bruises on his face. Ryo attempts to get up, but Shenhua puts a hand on his shoulder and tells him he needs rest. Shenhua cautions Ryo to wait. The location is the interior of a house. The electric light behind is switched on and a glimpse of darkness can be seen through the windows behind, so we can surmise that this scene takes place later the same evening. 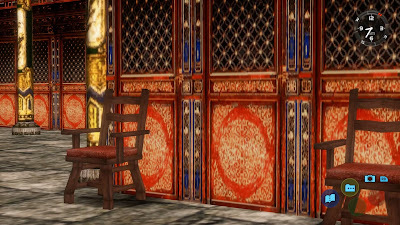 Although there are some new elements in the Shenmue II image (such as an electric light and a decorative rock), other parts of the room correspond closely: the design of the latticework in the windows behind and the red good-fortune diamond-shaped poster on the wall. 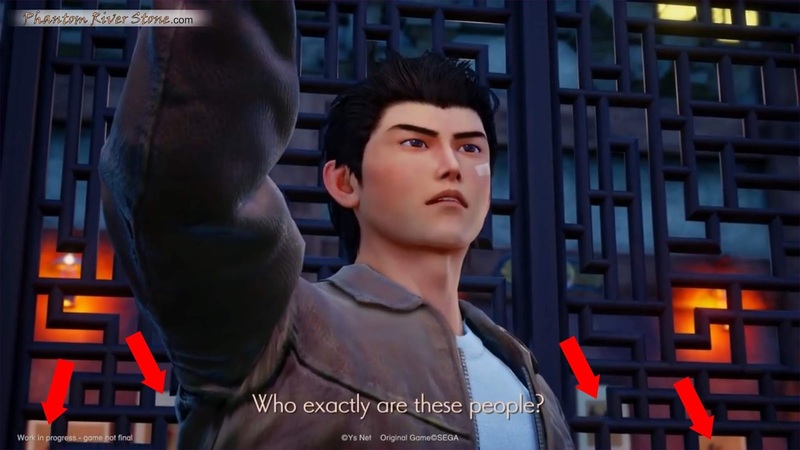 Furthermore, we can see that Ryo's bed in the Shenmue II image matches where Ryo is lying in the trailer clip. 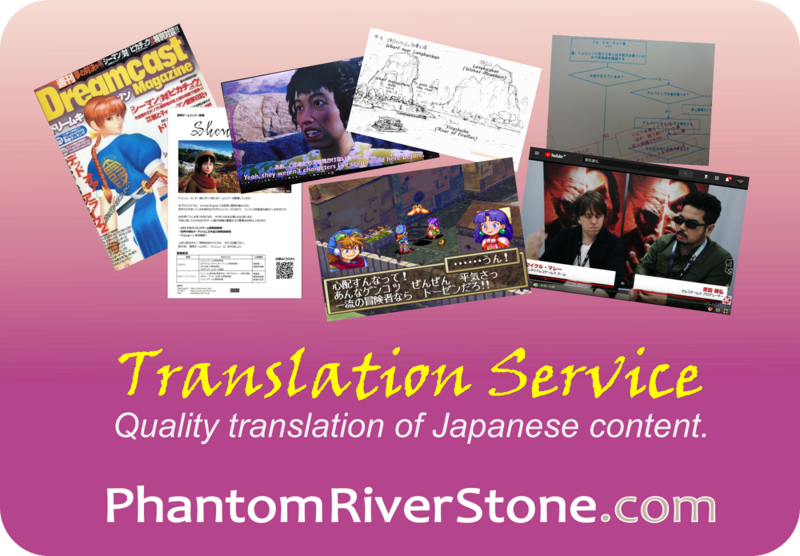 The English caption differs slightly from the Japanese audio here. "I've got to rescue Heishin-san!" Perhaps this is the name of someone that the thugs have kidnapped from the village? There is a further clue a little later in the trailer that may connect. 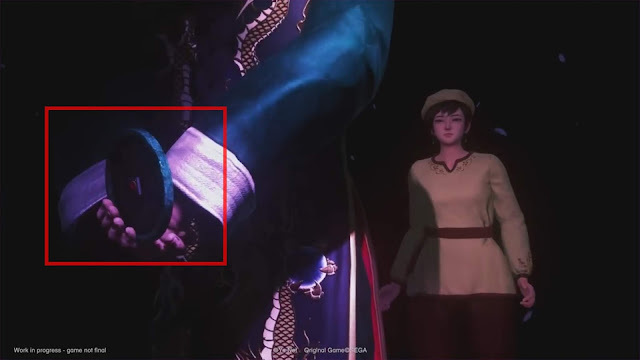 This part of the clip also reveals a change in appearance of Ryo's watch. It is slimmer, lacks the thick bezel of the original model, and has only a single crown at the side. One final note on this section is that Ryo appears to consider Shenhua's advice when she tells him that they need to stop and think about what to do. 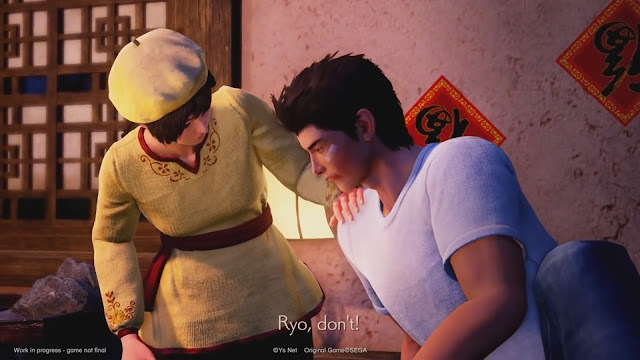 Unlike earlier in the story back in Japan, it seems that Ryo may be starting to listen to others at last. 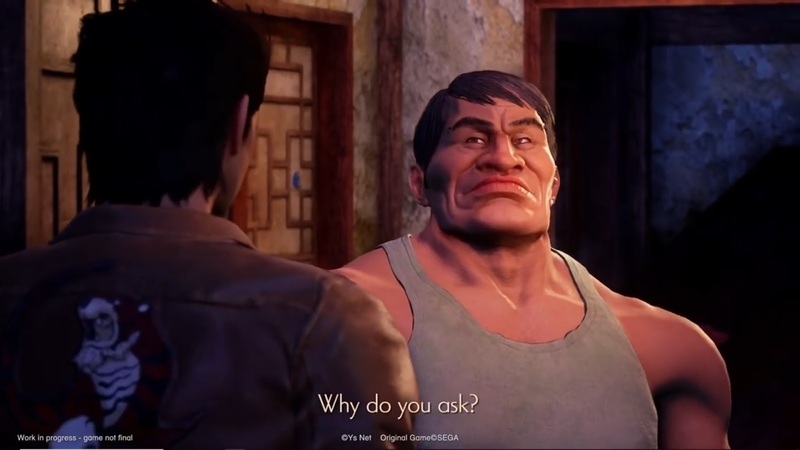 A new scene is shown, and in this one Ryo has no bruises or cuts to his face, placing it either earlier than, or well after, the fight with the Mongolian wrestler. Ryo is gathering information about thugs who have ransacked people's homes. The scene starts with Ryo outside the door of a house, which is opened by a well-built man. It doesn't escape our attention that the door has a rather large hole in the paper, a hint at what has taken place there. 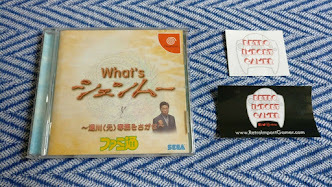 The words uttered by the occupant of the house are given in the subtitle "Why do you ask?" which seems an unusual thing to say when answering the door to someone. The caption here is a little misleading. (As mentioned in the previous post, it's likely that the subtitles were created specially for this trailer, so they will no doubt be made more accurate in the final release). The man shows Ryo the result of the thugs' visit, explaining that they were demanding to know the whereabouts of the Phoenix mirror. The interior has holes in the paper door panels, overturned furniture, crooked shelves and crockery smashed onto the paved floor. Next there are a couple of cuts made in quick succession. The first brief clip shows Ryo in front of an intricate and finely-crafted grill that may be a fence or gate.Through the grill in the background can be seen the electric lights and lanterns of some kind of building. In addition, a number of what appears to be paintings can be seen (indicated with red arrows in the image below) - perhaps an art gallery? In general it feels like a location that would fit a larger town, such as Choubu. The other point of interest in the above image is that Ryo has his right arm raised as he says "Who exactly are these people?" Perhaps he is pointing to the mountains, in the direction the thugs were last seen heading. The next short clip shows Ryo and Shenhua together, standing in front of a set of doors with a distinctive design. For some reason, Shenhua is at first gazing upwards, then Ryo draws her attention to something in immediately in front of them, saying "Shenhua! Isn't this..." (or equally, "What's this?"). Based on this reaction, perhaps Ryo has discovered a clue on the ground. Has Ryo discovered a clue? Where are they standing? The doors provide the clue here. You may recall an image of a "temple maiden" character who we were introduced to in Kickstarter Update #77. If we take a close look at those doors in the buildings behind her, we can see that the detailing of the doors confirms that they are standing at one of the buildings in this temple complex. 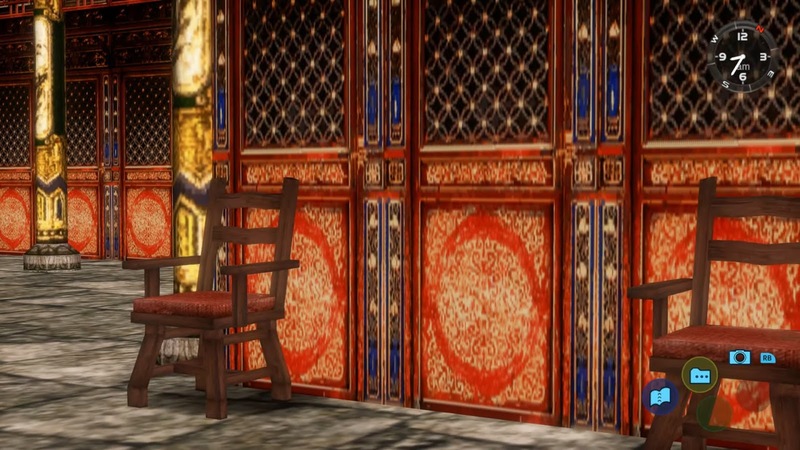 As an interesting side-note, doors with a very similar design have also been spotted in a Shenmue II cut scene, namely the flashback cut scene of when Shenhua was a baby. The image below was taken from an exploration video by BlueMue. Thanks to James Brown for this information! A flashback scene in Shenmue II has similar style doors as those on the temple in Shenmue III. 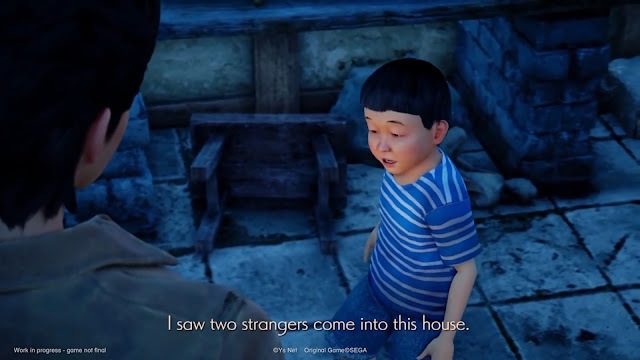 The trailer then cuts back to Bailu village, where a small boy is showing Ryo the inside of a house whose interior has been turned over - presumably a different house to the one visited in the earlier clip, as there is no sign of the owner of this home. This interior above is one we have in fact seen briefly in a video that was part of the Development Room Report right back in Kickstarter Update #65 in March 2017. The comparison image below shows the Developer Room image at the left and the relevant portion highlighted with a red frame. Note the chair lying on the floor at the same angle and in the same position, underneath the bench. (It would seem that the flooring tiles are now larger). We saw part of this room before in a Kickstarter Update. Here is a short clip from the Developer Room report, as Ryo starts to investigate the room. 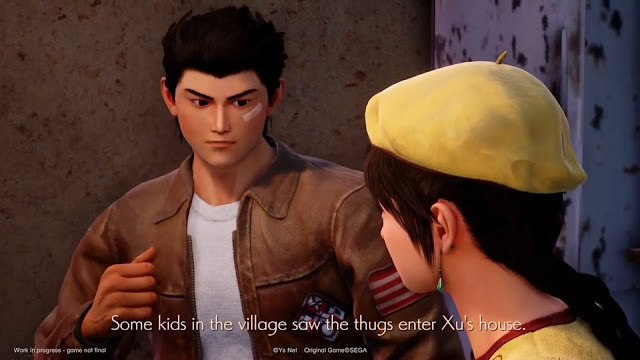 The final scene we will look at in this post shows Ryo telling Shenhua that "some kids in the village saw the thugs enter Xu's house". What do you think? Thoughts and theories below! This is the end of Part Two of the trailer observations. Part Three coming next.